Welcome to the home of the Adams County Fruit Growers Association. The mission of the Adams County Fruit Growers Association is to promote the fruit industry of Adams County, Pennsylvania by initiating and supporting promotional programs, supporting and encouraging educational programs, growing and marketing research and development projects, and any other programs or projects that shall be of benefit to the Adams County fruit industry. 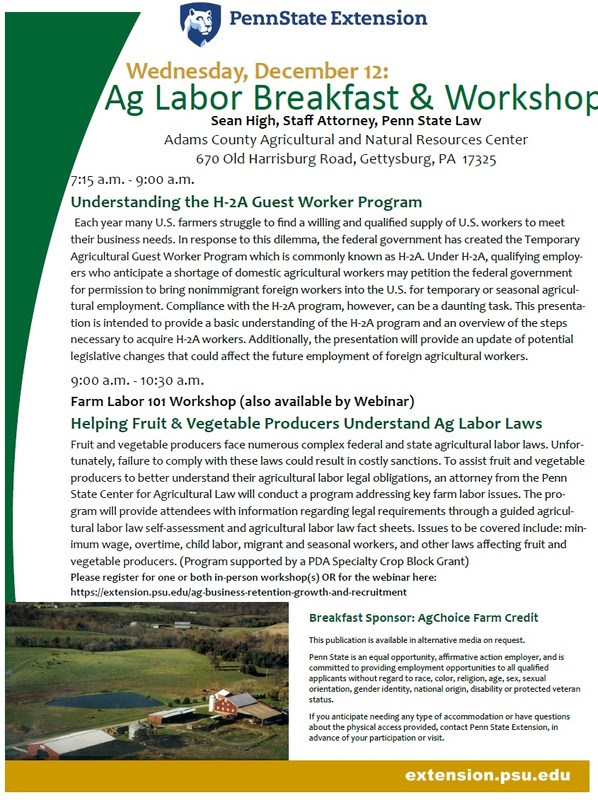 Mark your calendar - it will be held Monday, Februrary 18th at Biglerville High School from 8:00 am - 3:30 pm. To see the agenda and for more information, click “President’s Day Meeting” at the top of this page. Cost of attendance is $20 per member and $30 per non-member, and includes lunch. Mark your calendar! The 2019 ACFGA Banquet will be held Friday March 8th at 5:00 at the Dobbin House in Gettysburg. Tickets will be $30. Join fellow fruit growers as we honor the Outstanding Grower and celebrate another harvest season in the books. As always, there will be many prizes available! 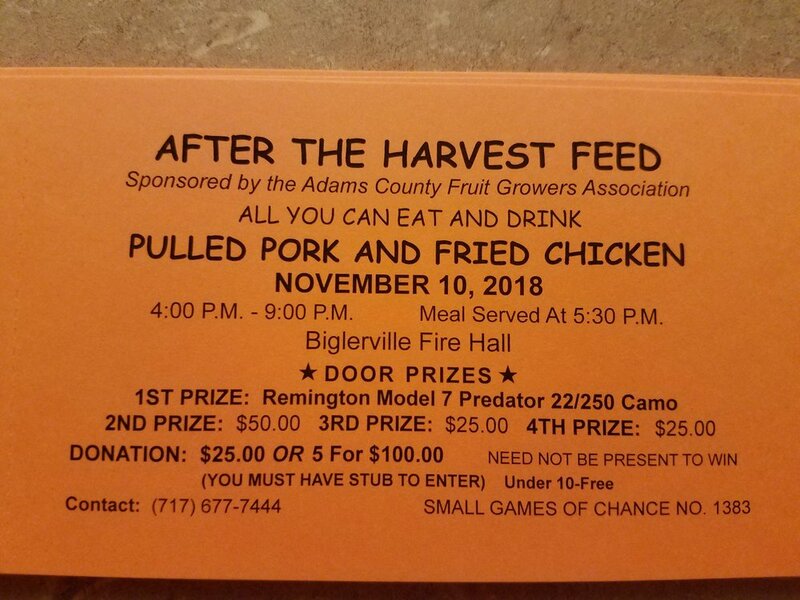 Join us at the After the Harvest Feed! As harvest winds down, we can all come together for a meal and some fun at the end of a wet season. Bounty of the County! In August our local farms are well into harvest, and the new event celebrates all that Adams County growers have to offer. Local Gettysburg restaurants will serve special menu items made to showcase our area's fresh produce. Growers work hard all season long to ensure a delicious apple, peach, berry, or vegetable. Dine in a local restaurant to celebrate harvest with us! A portion of your purchase supports research and education for Adams County fruit growers. Find out more here. As the weather warms up and the sky gets sunnier, our many types of fruit trees in Adams County will start to bloom. check out some of the locations that Destination Gettysburg has on their awesome list! There are several farm markets on the list if you want to stop for some delicious produce or other treats while you're out. On February 22, 2018, David Slaybaugh was awarded Outstanding Fruit Grower of 2017 at the ACFGA Annual Banquet held at Hickory Bridge Farm, Orrtanna. Dave is a fourth-generation fruit grower. He and his wife Wendy have three children. Dave began working for his Grandfather, Glen on Mt. Ridge Farm (MRF) at a young age. In 1984, he started working full-time. After Glen’s retirement at MRF, Dave worked for his Grandfather Richard, and then his Father, Steve. In 2015, Dave successfully took over management of MRF completely. In 2016, his son Blake also returned to the business full-time. Dave is committed to making the necessary changes to keep the business moving forward for future generations. He feels strongly that robotics are on the horizon and all of his new orchard plantings are being trained toward the fruiting wall system in anticipation of robotic harvesters. Dave and his family enjoy traveling to other states and countries to observe new planting styles, to learn about innovative technology advancements, and discover new varieties. In his spare time, Dave is also an avid hunter. Since 2015, two of the most exciting investments at MRF have been the GPS self-propelled tractor used for precise orchard planting and the self-steering harvesting platform. Both have saved a lot of time and labor. Lastly, Dave’s development of the (DOS) Premier Honeycrisp variety is progressing. Storage trials are very encouraging. This three-week-early Honeycrisp has proved equal to, if not better than regular Honeycrisp in terms of quality and characteristics. Congratulations, Dave Slaybaugh on receiving the 2017 Outstanding Grower Award!